It's a classic, typical noir set-up - played out in books, TV and movies for decades - but this is anything but a typical noir novel. While at the same time being somewhat of a typical noir novel. Highly creative wordsmith Adam Christopher (who's penned comics, and superhero novels as well as an official novelistation of modern-day Sherlock Holmes TV drama Elementary) gives us something unique. 'What if Raymond Chandler wrote sci-fi?' was the seed of this tale, which centres on Ray Electromatic, the last robot on earth. Ray is a private eye ... well, kind of. He's actually a hit man - his office gal and controlling supercomputer Ada having worked out that eliminations were far more lucrative than investigations. At least that's what Ada told Ray - he can't recall much himself, since his memory tapes only last a day and have to be started afresh overnight. Somewhere along the line he morphed from private eye to killer, so when a beautiful young woman, who seems strangely familiar, walks into his office with a problem, the hulking robot in the hat and overcoat isn't sure if he's really the right (mechanical) man to help her. But she does have a bag full of cold, hard gold, and a robot's gotta live. So to speak. I was very curious about MADE TO KILL, and I wasn't disappointed. It's a delightful, fun read, where the 'robot detective' gimmick doesn't overshadow or overtake the story - which at its heart is a very well written noir tale. There may be fans of 1950s-1960s LA noir that take issue with what Christopher is doing (introducing a robot detective etc), but I found this to be a loving pastiche, very well done, with the author bringing himself to the sub-genre with some fresh takes and creative choices, not just in terms of sci-fi. I really enjoyed Christopher's prose, as well as his storytelling. There were some terrific descriptions of action and people. Some great wisecracks and asides. Like a good noir, there is light among the darkness, funny moments to alleviate the shadows. In fact, there's an undercurrent of absurdity, enjoyably so. MADE TO KILL is one of those books that made me smile while I read it. It's a page-turner. There were moments where I feared it might twist too far or shift fully into sci-fi, after a very noir beginning (robot detective aside), but that didn't happen. I felt the author got the balance right, and I was pleased with how Christopher chose to unfurl the conspiracies, betrayals, and plots lying beneath the surface of Ray's case. 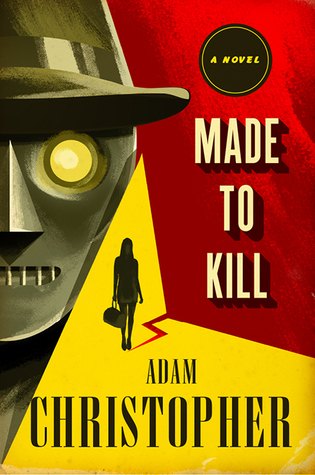 There's quite a bit going on in MADE TO KILL, with plenty of fun nods to various things, from noir fiction to film-making to Los Angeles history to sci-fi tropes. Overall, a unique and very enjoyable read. I understand this is the first in a planned trilogy. I'll definitely be reading the next one.